Rush Truck Centers is the premier solutions provider for the commercial vehicle industry. With over 100 locations from coast to coast, no one can match Rush’s network reach and scale. They provide their customers an integrated, one-stop approach to the service and sales of new and used heavy and medium duty trucks, aftermarket parts, service and collision repair capabilities, and a range of financial services including financing, insurance and leasing and rental options. For 50 years, Rush Truck Centers has been dedicated to exceeding customer expectations – with the values that guide their business, the solutions they offer, the brands they represent, their facilities and their exceptional customer service. 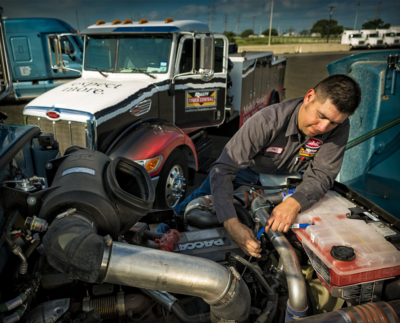 Rush Truck Centers are committed to keeping their customers up and running. Every Rush Truck Center employee is committed to the company’s core values of productivity, fairness, positive attitude and excellence. No one offers you more than Rush Truck Centers. Rush’s goal is to help you drive efficiency in your operation by offering the products and services that solve your problems. Whether it is vehicle integration engineering and installation, mobile service and technicians, complete outsourced shop management, alternative fuel systems and service, real time vehicle repair status, telematics, value-driven replacement part options, ready to roll inventory or just plain advice, Rush Truck Centers are committed to being your complete solution provider. And, if Rush doesn’t offer the solution you need today, just ask and they will do everything they can to offer it tomorrow.